Many of the homes and gardens of the UK have fences of the waney lap variety made from larch or sometimes Douglas Fir they have adorned the rear boundaries of homes for many years. Although waney lap fences are very common at the rear of a property, they aren’t used quite so much at the front of the property. People often prefer something a little more decorative adding style and providing a little more of a statement. 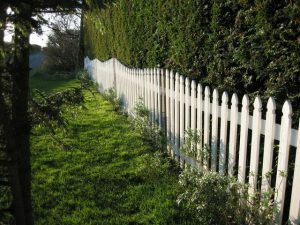 There are many types of fences and walls for front gardens, one of the more popular varieties is the good old Picket Fence. The Picket Fence timeless colonial style. How often have we seen on American movies neighbourhoods adorned with miles of picket fences, often white washed with a little gate up opening on to a path to the front door. This timeless statement of often associated with Colonial America is as popular today as it was in the 17th Century. All that said few people may realise that although the picket fences is today symbolic of Americana it’s origins lie very much in British History too. Not only have country cottages used picket fences for centuries, long before we colonised the Americas but the sport of Cricket also has used picket fences to mark the boundary of a cricket pitch, this gave rise to the expression rattling the pickets when the ball was hit to the boundary. No matter what the origins of the simple and beautiful picket fence, it’s a timeless and effective way of securing the boundary of your front garden providing kerb side appeal along with practicality. call Advanced Fencing, Paving and Gates, Wigan today.